On Sunday I blogged on what is happening with respect to housing in Ireland, including a breakdown of some key stats, and also did an interview on This Week on RTE Radio 1. In response, I got the following question via twitter: “So is it a bubble in Dublin then? And will govt. plans to build more houses help normalise?” These are not really questions that can be answered with 140 characters. I’ll take each question in turn. Is a new bubble forming in Dublin? Having fallen by 57.4% from the peak in 2007 (houses 56%, apartments 63.3%), since August 2012 prices in the capital bumped along the bottom for a few months then started to rise. Between Nov 2012 and Nov 2013 prices grew by 13.1% to be 49.2% lower than the peak. It is clear that property prices in Dublin are rising steadily at present (see CSO data and AIRO interactive graph). Housing bubbles generally form when there is an excess of demand, credit and confidence in prices. This is not the case in Dublin at present, with the rise in prices being principally driven by two related forces. First, both residential buyers and investors are seeking to enter the market at its bottom; this way they minimize their cost, maximize any growth in equity, and for investors gain rental yield. Second, they are competing for a small number of available properties leading to bidding scuffles. Unlike a normal bubble when there is a large number of property transactions and mortgage draw downs, transactions and draw down in Dublin are presently at 40 year historic lows. Slowing properties coming to the market are very high levels of negative equity (c. 50% of all properties with a mortgage) and low levels of new build (less than 10% the number built in 2006, and over 50% are one-offs that are not coming to the market). Ergo, prices rise as demand outstrips supply. Does this constitute a new house price bubble? Not in the classical sense and it is only a bubble if prices rise in excess of what one might expect given the wider economy (and given they are still almost 50% less than their peak at best we’re only at the start of a potential bubble). Will building more houses help normalise any bubble effect/slow house price rises to maintain affordability? With respect to new supply by private developers and government. Whilst there is sufficient land zoned in the four Dublin local authorities (2,575 hectares/6400 acres for 132,166 units) and there are still a large number of outstanding planning permissions, the big issue is development capital and perhaps re-jigging planning permissions to cater for high density housing in some cases rather than mostly apartments. The same issue applies to the government who have little money to invest in capital expenditure programmes, which they have significantly reduced over the past few years. In both cases, even if development capital was sourced, it would be 12-24 months before new supply was available to the market/social housing waiting list. As a consequence, new supply from these sources will be limited throughout 2014. There are significant levels of mortgage arrears nationally (we don’t have figures for Dublin alone). With respect to principal residential dwellings 141,520 (18.4%) of all mortgages are in arrears and of those 99,189 (12.9%) are more than 90 days behind in payments. The situation is worse for the buy-to-let sector where 40,426 (27.4%) are in arrears, where 31,227 (21.2%) are more than 90 days in arrears. Whilst repossessions have so far been small, it is expected that they will grow over the next couple of years. This will increase housing stock available to the market. However, their present occupants would still require accommodation having knock-on effects with respect to the social housing waiting list and the private rental market. As house prices rise and household emerge from negative equity those wishing to trade-up or down, or to move to a new area, are more likely to place their property on the market. This would create some supply, but may not lead to prices levelling off. This is for two reasons. First, part of the reason that house prices fell so much is that the stock on the market was not representative of all stock, but rather distressed assets that owners felt compelled to sell in a falling market, with owners who could afford to avoid selling staying out of the market (typically those who are better off). Second, the majority of trading that has taken place has mainly been related to lower priced property rather than higher-end stock. We might therefore expect prices to rise a little simply as function of the nature of stock coming to the market changing, with better stock demanding higher prices and higher value properties starting to be traded more frequently. This effect would probably be little affected by more supply. We lack detailed data concerning market activity in Dublin, but industry sources are suggesting that it is most prevalent in the city core and South Dublin. As competition for property grows in these areas it is likely that other parts of the city will become more active. The Dublin housing market stretches far beyond the M50 to the outer suburbs and commuting belt. These areas still have locales with some oversupply. Moreover, the completion of some unfinished developments would also add some new supply (though the number of such developments in and around Dublin is quite small). Both the activation of other parts of the Dublin market and the completion of unfinished developments will re-distribute some demand and work to counter supply driven price rises. Nevertheless, given the desirability of central and South Dublin and limited new supply in those areas in the very short term, one could reasonably expect rising prices to continue in the city core and South Dublin in the immediate short-term. Two factors that might disrupt this scenario is a tailing off of demand and limited access to credit. A phenomena that occurs after some house price crashes is a dead cat bounce wherein prices rise quite quickly from the bottom, but then slow and fall again before finding an equilibrium or rising again (this happened in London following the crash at the end of the 1980s). The reason for a dead cat bounce is that those who have been waiting for the right time to enter the market (both residential buyers and investors) have done so and market demand drops leading to less competition for property, or supply has risen to meet demand. Given the level of cash sales at present (c.50%), it is possible to envisage such purchases drying up and the market returning to a more balanced status where mortgage-backed sales predominate, thus removing a significant source of competition-driven pricing. As such, a dead cat bounce could occur in the case of Dublin. Moreover, access to credit at present is limited. In the first three quarters of 2013 only 8,711 mortgages nationwide were drawn down. Caution on behalf of lenders will limit the number of mortgages issued and the value of such mortgages, thus restricting credit-fuelled speculation and associated price rises. With respect to the mid-to-long term it seems likely that there will be a continued rise in demand that may create supply issues in the Greater Dublin region. 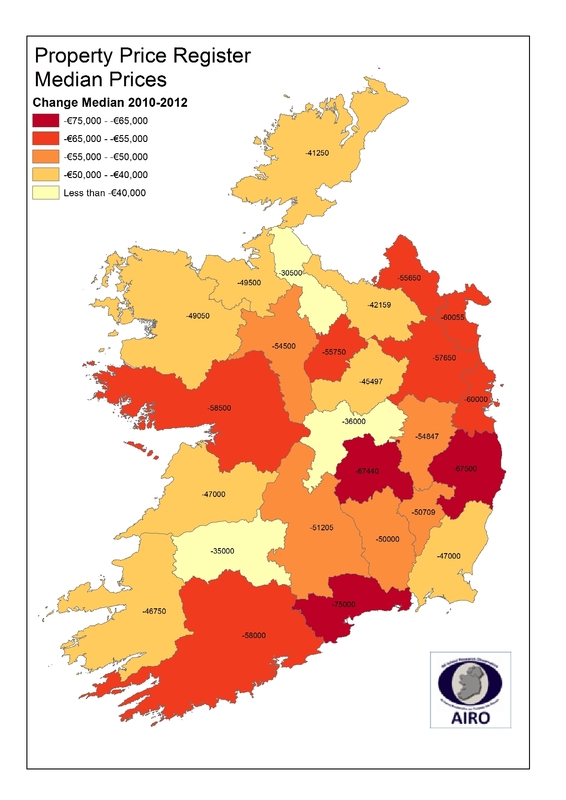 The new revised CSO regional population projections 2016-2031 predict: “The Greater Dublin Area will see its population increase by just over 400,000 by 2031 if internal migration patterns return to the traditional pattern last observed in the mid-1990s. … The population of Dublin is projected to increase by between 96,000 and 286,000 depending on the internal migration pattern used, while the population of the Mid-East is set to increase by between 78,000 and 144,000.” These figures are based on projected national increase and internal and external migration and seem reasonable given the dominant economic position of Dublin in the Irish economy. In addition, household fragmentation will also be a source of demand. The extent to which such population growth/household fragmentation will affect property prices is dependent on the extent to which housing supply meets demand as and when it is required. In the short term there are potentially different scenarios as to what might happen with house prices in Dublin — they might rise steadily, rise and then level off, or suffer a dead cat bounce. Or a two-speed market might emerge in the Dublin region, with a division in market activity and pricing patterns between the city core/South Dublin and the rest of the city. Which scenario plays out is dependent on a range of factors that shape supply and demand and how they evolve. As I noted on Sunday, the market is far from normal at present and in need of a lot of correctives that could alter how the market behaves, and other factors such as the wider macro-economic context could re-cast how the market evolves. What we really need right now is some decent modelling using detailed housing, demographic and economic data of potential housing demand and supply for the Dublin region and what we might expect to happen to prices under different scenarios. We also need similar models for the rest of the country, which has a very different set of issues. Perhaps the government might commission such work? Perhaps not unsurprisingly the start of 2014 has been greeted with a number of commentaries in the media concerning the Irish housing market, specifically about the upturn in the Dublin house prices and the possibilities of the start of a new price bubble, and the development of a two-speed housing market between Dublin and the rest of the country. Part of the impression being given is things might return to ‘normal’ in the capital if issues of undersupply of family homes can be resolved, though the situation elsewhere is less certain given oversupply, demographics and labour market conditions. The reality is that housing in general is far from normal across every indicator there is both in and outside Dublin and a rise in house prices in the capital, whilst welcome for those in negative equity, is a symptom of these problems and a lack of a housing strategy to deal with them. Prices will almost certainly continue to rise in the capital during the year, but it is only when all the other indicators – such as mortgage arrears, housing waiting lists, etc – start to be righted that the market will start to resemble a normal one. That is likely to take a number of years given the depth of problems at hand. Mortgage arrears for principal residences up to Q3 2013 (Central Bank): 141,520 (18.4%); of those 99,189 (12.9%) are over 90 days in arrears. Mortgage arrears for buy-to-let (BTL) up to Q3 2013 (Central Bank): 40,426 (27.4%); of those 31,227 (21.2%) are over 90 days in arrears. Housing Supply (CSO, Census): Oversupply of property outside of Dublin, with high levels of vacancy (10%+) in all but five local authorities; undersupply of family homes in some parts of Dublin. Pyrite-infected homes (Dept Environment): 74 estates, consisting of 12,250 units. As I’ve argued previously, we need of a coordinated strategy to deal with all the issues affecting housing in Ireland, including long-term plan of future need, and this needs to be part of a wider National Development Plan/National Spatial Strategy aimed at cross-sectoral recovery. At present, we just seem to be hoping that the various problems will somehow be corrected through the market or piecemeal, ad hoc or limited schemes, rather than taking a more proactive, coordinated approach. It has been three years since NIRSA published the Haunted Landscape report on the impacts of the property crash. Since then, Ireland’s housing market has been through some turbulence. At the same time, however, depressingly little has changed. Overall we are still very much mired in the market-oriented approach to housing that propelled the bubble. Only now, matters have been made worse by the extraordinary levels of debt that households are paying off for properties that have dramatically decreased in value. Meanwhile, mortgage credit has all but seized up, while negative equity has created a spatial trap for many households. This has all taken place against a backdrop of rising unemployment and deepening austerity. Yet in mid-2013, we are once again hearing a resurgent chorus singing that well-worm refrain: market recovery. Although the evidence of this ‘recovery’ is dubious at best – a selective reading of supposed demand for particular types of properties at particular prices in particular parts of Dublin used to indicate a more generalised upturn in the property market – the point has been reiterated in recent months in a range of media reports citing various vested interests. Similarly, an article in the Irish Times last week talked of a “feeding frenzy” on Dublin properties – with international (vulture) capitalists ‘scrambling’ to pick up asset portfolios – as if this signalled something positive, rather than anodyne if not outright destructive, for the Irish economy. This critical mass of uncritical property cheerleading is beginning to feel sadly familiar. With all the effervescent talk of rising property values and calls for new (state-supported) construction projects, it is worth revisiting the unfinished estates that became the symbol of the crash. 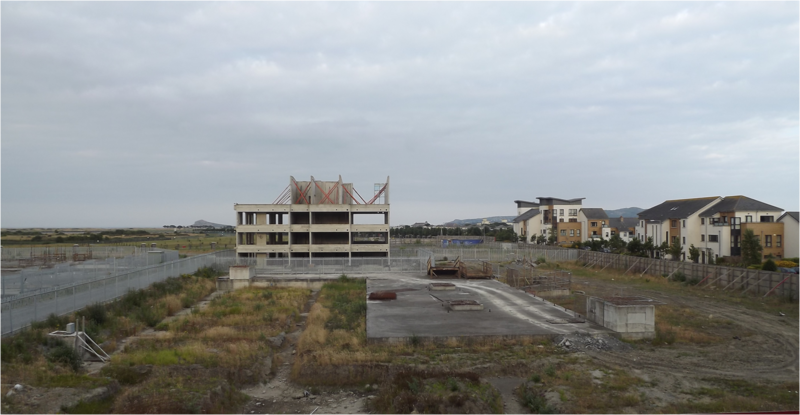 In the aftermath of the collapse of the Celtic Tiger, unfinished estates were singled out as symptomatic of an unambiguously dysfunctional approach to property development. Five years on, despite site resolution plans, the social housing leasing initiative, and statistical solutions, very little has changed on many of these estates. One of the major reasons for this lack of progress is that policy responses have continued to privilege the role of the market. Residents on unfinished estates around the country are, in various ways, still experiencing the physical, financial, and emotional limbo of living in these incomplete environments. Some are experiencing more acute problems than others. But, given the suite of policy responses and market conditions that have followed the crash, it is fair to assume that none are devoid of problems. Recently, I paid a visit to the Red Arches estate, part of The Coast development in Baldoyle. Overall, Red Arches is by no means one of the worst examples of an unfinished estate. The estate constitutes a section of a larger development, which itself forms part of cluster of similar developments straddling Dublin’s North Fringe and Fingal County. The Coast, built by Menolly Homes, is of a type of sprawling residential development more representative of suburban Dublin than any other part of the country. When completed it was expected to house 20,000 people in a mixture of apartments, town houses, and family homes. This was to be combined with “office, hospitality, and retail space”, which remains largely vacant, “and eighty acres of green space”. Occupancy levels are quite high and the estate itself is lively. These traits were in evidence during my visit with cars driving in and out, and pedestrians strolling, or working in the recently installed community garden. The estate has a series of main roads running through it, which hive off into residential streets. The apartments and houses on these streets also open onto nicely landscaped back gardens communally shared by adjoining neighbours. On the whole it seems like a pleasant place to live. That is, if it weren’t for the presence of the hulking shell of an abandoned tower block that has been sitting idle since the downturn. 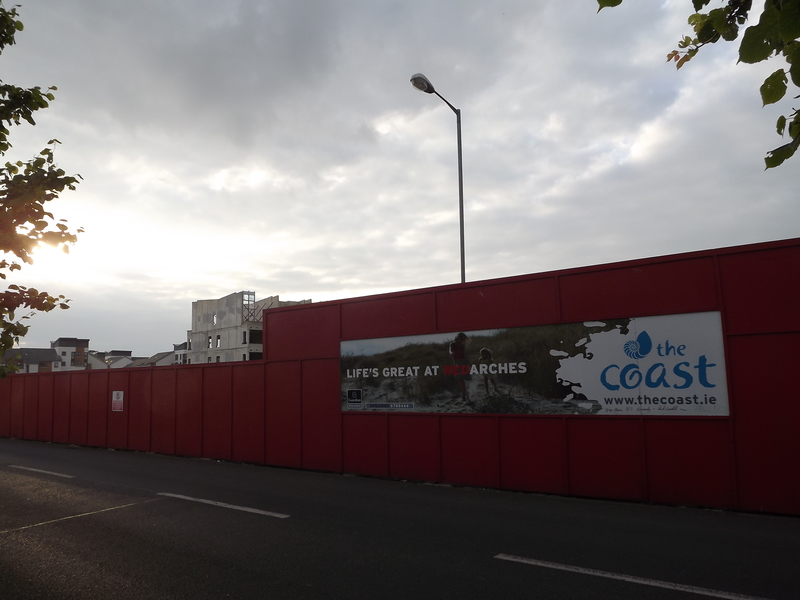 Entering the estate from the Coast Road, the first thing you see is the red hoarding that surrounds the tower block. The latter protrudes on the skyline as you advance further in. The fenced off site is sizable, much larger that the area covered by the tower block itself. There are houses and apartments to the left of the hoardings and immediately in front of it. The tower has been left derelict for more than five years. For residents in its immediate vicinity, this has meant a long-standing vista of the derelict site, or worse still, the hoardings. As tends to be the case more generally with residents on unfinished estates, it took those in Red Arches some time to realise that the tower block wasn’t going to be finished any time soon. In October 2012 some of them started a Facebook campaign to have it demolished. Using the catchy injunction “knock the block” as their campaign name, the residents sought to draw attention to some very pressing health and safety concerns posed by the presence of the tower. When the developer downed tools the scaffolding was left there to rust, making of the tower an oversized jungle gym for the teenagers of the area. The campaign’s Facebook page is replete with photos of groups of young people climbing the tower and exploring it inside. The structure also includes an underground car park, which was prone to flooding. When this happened, residents on the estate told me, the young people would build rafts to explore the flooded cavern. 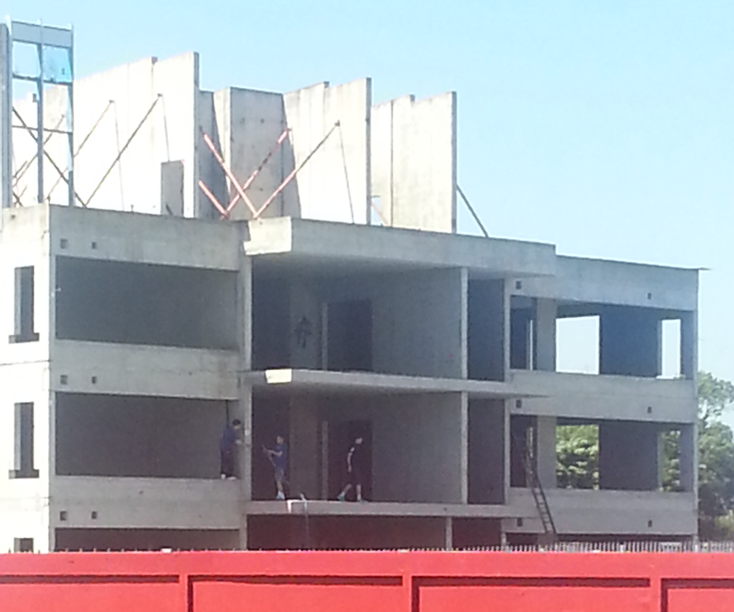 On the instruction of Fingal County Council, the developer responded to the flutter of media attention instigated by the campaign by removing the scaffolding, putting up more secure fencing, and closing off the underground car park. The latter caused a bit of a short term crisis as the rats dispossessed of their derelict home fled into the estate proper. Thankfully, they dispersed again within a few weeks. Despite the measures taken, however, the tower has remained accessible to those who seek to use it for exploration, as photos uploaded more recently depicting a group of young people on the top of the structure shows. More significantly, the developer doesn’t appear to have any immediate plans to demolish the tower, and it is likely to remain in its current state of structural limbo for the foreseeable future. This is an example of the types of problems that are produced by a housing policy that continues to privilege the role of the market. 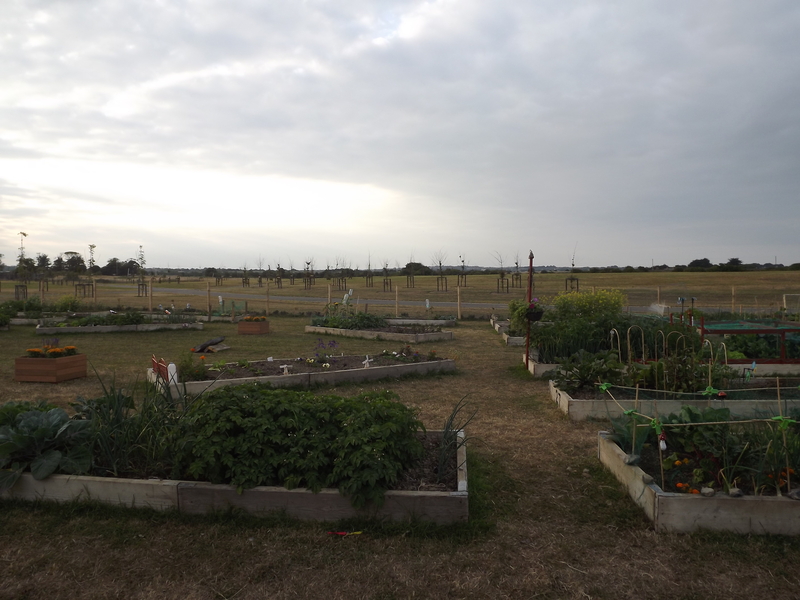 Under the current planning and taxation legislation, which has not been significantly altered in the aftermath of the crash, once a developer has outstanding planning permission for a site that they own they are allowed to keep it in a partially built state. They incur no financial penalties for doing so and, with the exception of forcing them to comply with some minimum safety standards, there is little the local authority can do to compel them to either finish or demolish partially built structures. Naturally it suits developers to wait and see how things turn out before cutting their losses by demolition. But this leaves residents in the frustrating and unjust position of having to live amidst these ruins until an undetermined time in the future when a change in market conditions will allow something to be done. Although Red Arches is not in one of the select areas where the current upswing in sales prices is being celebrated as the return of the property market, the estate is in a desirable location that is close to Dublin and, therefore, likely to see a return of the market sooner than many other parts of the country. However, judging by the current demand for family homes it still seems unlikely that an apartment block on the urban fringe will be considered a prime contender anytime soon. For residents on unfinished estates, the uncertainties they have been forced to live with have, to a degree, put their lives on hold. This is not to suggest that people are not making the most of their situation and getting on with their lives as best they can. But the ambiguities regarding the places they live make it harder to plan for the future. The supposed ‘stabilisation’ of the Dublin market will do little to alleviate the problems they face. At a more general level, in a context of increasing market fragmentation, an upswing in property prices does nothing to address the spate of more serious housing crises Ireland is still facing. For any real progress to be made in this regard there needs to be a shift away from the perspective that a rise in property prices will provide a panacea that will impact on housing conditions across the board. Any benefits reaped from the alleged rise in prices are likely to affect only specific geographical areas and benefit particular social classes. The measures that would need to be taken to enable the move away from a developer-led approach to housing would need to involve changes in national policy and to the mechanisms through which local authorities are financed, coupled with a broader shift in attitudes towards property and development. Such a shift would take time, and the discussion of its intricacies is perhaps best left for another post. But in dealing with the issues faced by residents in Red Arches, a good start would be to implement proposals from Fingal’s Cllr Cian O’Callaghan* to impose strong limits on planning permission durations, so that when a developer starts construction on a site they have a much shorter window (possibly one year for smaller developments and two years for larger developments) to complete it. This could be coupled with the introduction of taxes on half-built houses. These proposals hardly seem overly excessive and would immediately improve the lives of residents living on unfinished developments. Rather than getting carried away on a wave of euphoria about market recovery – the hyperbole around which is more substantial than the underlying upswing it purports to represent – seriously considering proposals such as these will do much more to put us on the right road to addressing Ireland’s housing crises. Eurostat, the European statistics agency, recently released the Q3 2012 results for its pan-European house price index (HPI). The data charts house prices on a standardized basis for 2007-2012, baselined against Q2 2010 (=100). The index tracks price changes of residential properties purchased by households (flats, detached houses, terraced houses, etc. ), both newly-built and existing stock. The Member States’ HPIs are compiled by the national statistical institutes, while Eurostat calculates the euro area and EU HPIs. The AIRO team have compiled these data into an interactive data visualization accessible on the AIRO website. What the data allow is a comparison of whether house prices have gone up or down over time with respect to the baseline. For example, if we consider Ireland against a baseline of 100 in Q2 2010, in Q3 2007 house prices were indexed at 151.7 but had fallen to 75.3 by Q2 2012. In other words, house prices had halved in valued over that period. What the data reveal is that during this period of European financial crisis property markets behaved in four different ways across Europe. 1. Prices have declined continuously, either steeply in the case of Ireland, Spain, Romania and Bulgaria or more modestly such as the Netherlands and Cyprus. 2. Prices declined and then have either levelled off (e.g. Denmark, Slovenia) or have bounced back modestly (Estonia, Latvia, Lithuania, which all experienced very dramatic and rapid declines). 3. Prices have bounced along within a few percentage points of the baseline (e.g., Austria, Czech Republic, France, Greece, Hungary, Italy, Malta, Slovenia, UK) and effectively have flatlined. 4. Prices have increased modestly but steadily (e.g., Belgium, Finland, Germany, Luxembourg, Sweden). These differences arise due to issues such as the nature of the national housing markets (e.g. proportion of renters/owner-occupiers), the robustness of the wider economy during the crisis, and wider property market issues such as levels of oversupply where excess supply, coupled with a financial crisis linked to property, work to depress prices in the absence of sufficient demand that would halt decline. There is tentative evidence that the Irish decline might be starting to level off, but we need a few more quarters of data to reveal whether this is a sustained trend. The decline, however, has been the worst in Europe in terms of sustained, rapid decline with no levelling off or bounce back. The recently releaseed Residential Property Price Register provides actual sales prices of houses and apartments in Ireland since January 2010. Yesterday we put up a set of interactive graphs of the data along with some commentary concerning its scope and quality. Today is the turn of some maps and a look at the geography of the actual sales prices. Below are five maps – the median price of property in each local authority for 2010, 2011 and 2012, actual change in price and percentage change in price 2010-2012. We’ve used median rather than the mean to try and control for the skewing effects of outliers and errors in the data (as detailed in our post yesterday). What the maps show is a clear drop in prices across the country (click on the maps for higher-res versions). 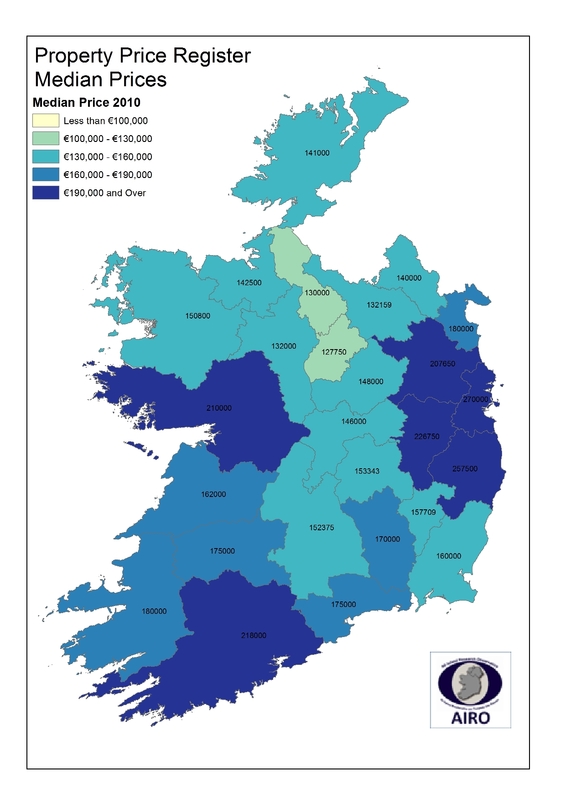 In 2010 no local authority had a median below €127,000. By 2012, nine local authorities have median prices below €100,000 and a further nine below €127,000. All of these local authorities are predominately rural in character with a clear divide evident between the principal cities and their commuting hinterlands and everywhere else. 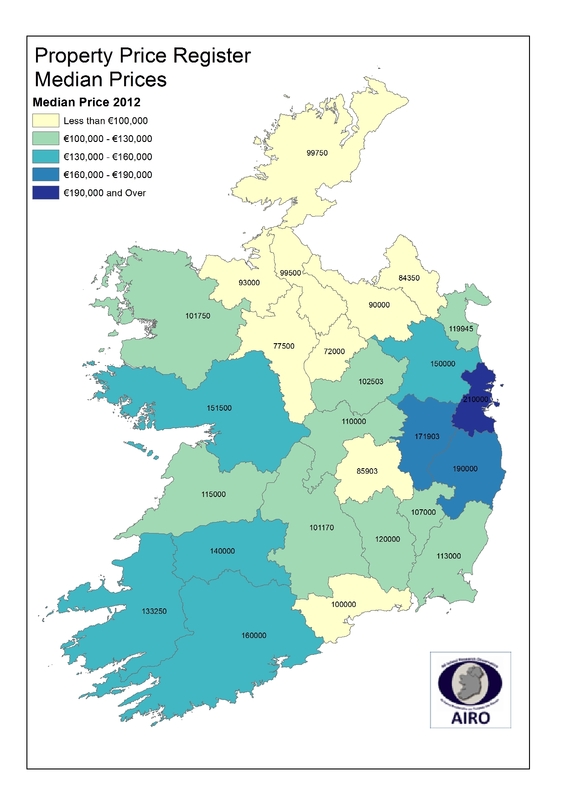 In absolute terms, the biggest drop in median prices between 2010-2012 were in Wicklow, Laois and Waterford, all with inexcess of €67,000 drops in median prices. 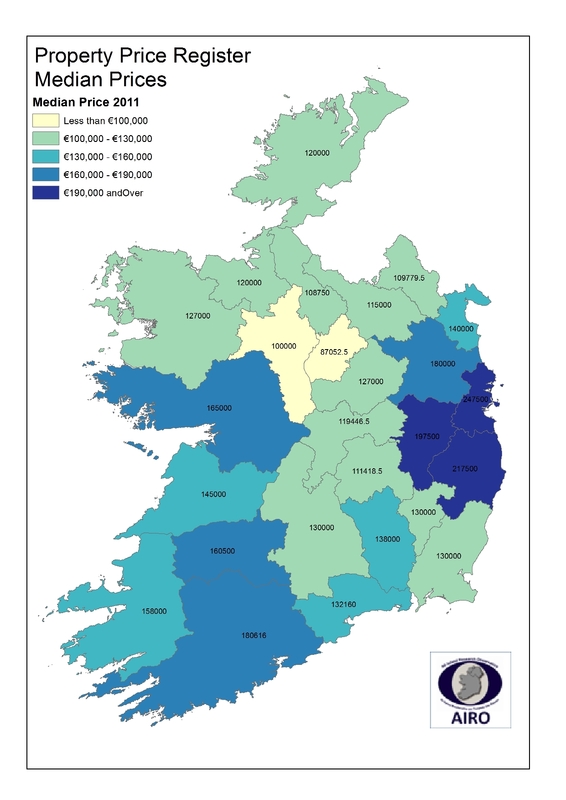 In percentage terms, Laois and Waterford both sustained large drops in median prices, in excess of -40%, and are joined by similar drops in Longford and Roscommon, with Monaghan not far behind (-39.8%). In contrast, median prices in Dublin, Kildare and Limerick only dropped by between -20-25%. Perhaps somewhat surprisingly, the percentage median change for Leitrim is only -23.5%, though this is partly reflective of its overall, relatively low prices. Also see the interactive graphs. 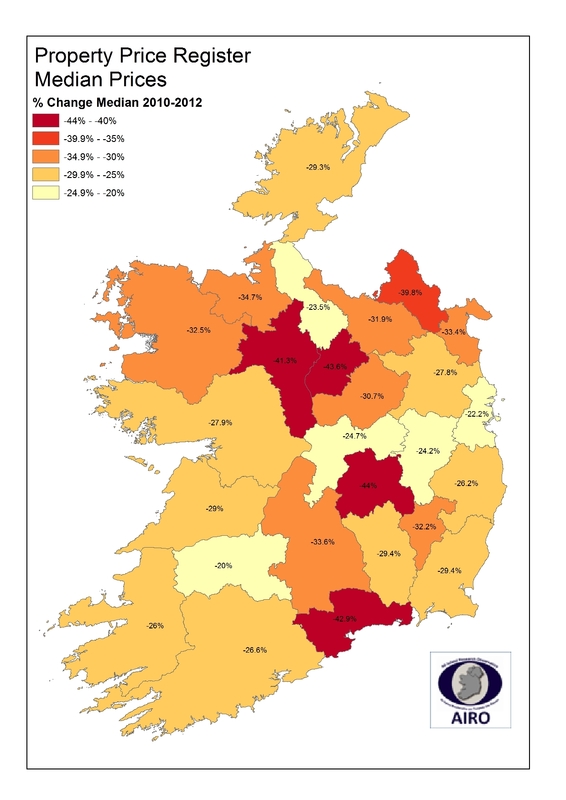 What the maps reveal, in contrast to CSO price index which only provides an overview of residential property prices for Dublin and elsewhere, is that there is a geography to actual sales prices, with prices falling more in some parts of the country than others, affected by local conditions and markets. There will also be a geography to the market bottoming out and to market recovery. Whilst the Central Bank report that the market may take up to 18 years to recover, where and when will vary spatially, and we’ll now be able to track such patterns using the PSRA data.